The file c:\my documents\MyWordFile.doc on the server will be copied to %TEMP% folder on local machine and opened with the default associated program. DestinationFolder: Optional - a folder on the client machine where the file will be copied to. If DestinationFolder is omitted, the file will be transferred to %TEMP% folder on the local machine. T: Transfer file from server to local only, do not open. O: Open the file with the default associated program after transferring. This is the default option if the parameter is omitted. The file C:\Temp\PictureTest.jpg on Terminal Server will be copied to C:\Temp\ on the client (local) machine. The file will be opened in default Image Viewer on the local machine. 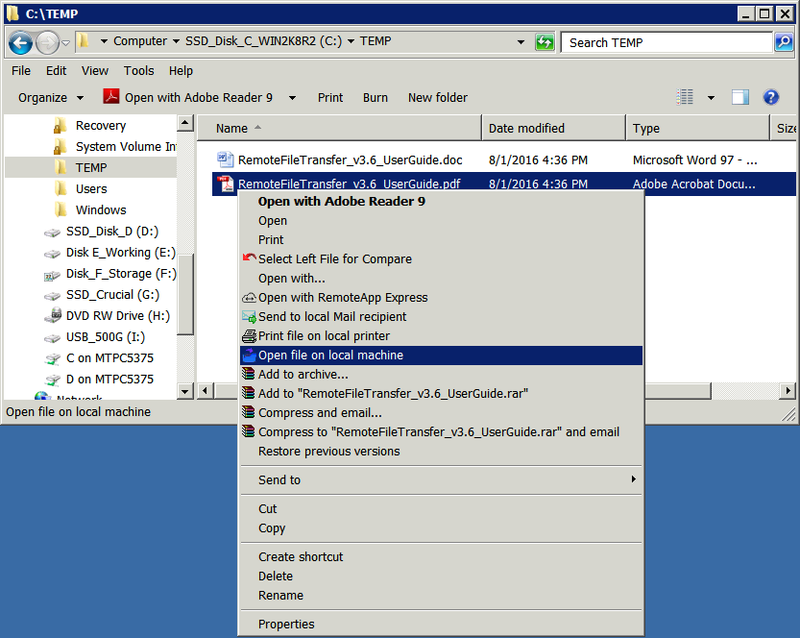 On the server, there are 3 commands added to Windows Explorer context menu. When right click on a file, user will have option to Send the file to attach to local Outlook email (Send to local Mail recipient) or to Print the file on default printer installed on local machine or Open the file on local machine. - Use Regedit.exe to edit the registry. WARNING: IF YOU ARE NOT SURE ABOUT THIS, DON'T DO IT. From now, during a remote session (RDP) every time when you double click on a JPEG picture file, it will be transferred to and opened on the client machine using the default associated program on the client side. With this configuration, inside Outlook, when you double click on a Jpeg attached file, that file will be transferred and opened on the client machine as well. Repeat the same steps for any type of document file that you want as .doc, .xls, .pdf, etc. Create a MS Word macro on the server side to add option Send As Attachment to local. This feature works as Word standard Send as attachment, but the file will be transferred to local machine and attached in a new email on the local machine. Shell "RemFileTransfer.exe /S:" & sTempFile & " /O:M"